If your locked out or have a broken Yale Lock. This a picture of a Rim Cylinder Lock, commonly referred to as a Yale Lock. 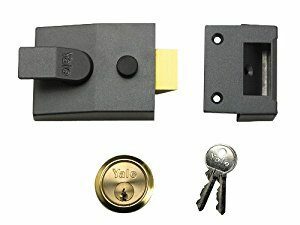 This picture shows a Yale Lock, The top image is of a Grey Nightlatch, the fixes to the back of the door, and the Brass cylinder at the bottom, is the part you will see on your front door. The name was later changed to Yale & Towne. Yale registered 8 patents with the U.S. Patent and Trademark Office between 1843 – 1857 about his pin tumbler safe lock, safe lock, bank lock, vault and safe door bolt and padlock. In the twentieth century the company expanded worldwide through purchases, acquisitions and joint ventures with other companies in the industry and employed more than 12,000 people. It established a British operation by acquiring the business of H&T Vaughan, a long-established lock manufacturer in Wood Street, Willenhall, the historic centre of the British lock industry, and became the major employer in the town. “Yale locks” became the generic term in the UK for pin-tumbler household locks and keys, although Yale neglected the service business and effectively gave away the lucrative aftermarket business in replacement key-blanks, which sold in the millions annually.